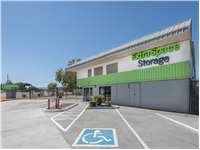 Sacramento Self Storage at 1353 Florin Rd. Located at the corner of Florin Rd. and Freeport Blvd., Extra Space Storage serves Sacramento residents near Southwestern Sacramento, Golf Course Terrace, Woodbine, Meadowview, Pocket, Freeport Manor, Brentwood, and Parkway. Locals will recognize our facility across from CVS and California Family Fitness. We're also accessible for residents of nearby apartments, such as Woodcrest Apartments, Land Park Villa Apartments, Sycamore Terrace Apartments, Greenhaven Oaks Apartments, Sacramento Manor, Southcrest Apartments, Windbridge Village Apartments, Ashford Park Apartments, and Stonebridge Apartment Homes. Extra Space Storage is about 2.1 miles from Sacramento Executive Airport, making us an accessible solution for Sacramento residents who need storage units while traveling outside of the area. Extra Space Storage on Florin Rd. offers a variety of storage unit sizes and amenities, including vehicle storage and advanced security measures. We're the self storage solution for you in Sacramento! Our Florin Rd. storage facility has units as small as 5x5 and as large as 20x15. We also have storage units with drive-up access, first-floor access, elevator access, and outdoor vehicle storage. Need secure vehicle storage in Sacramento? Extra Space Storage offers 10x5 to 10x25 outdoor parking spaces and 10x10 to 20x15 drive-up units that can accommodate cars, motorcycles, boats, and RVs. Our Sacramento storage facility has an electronic gate access with personalized entry codes, individually-alarmed units, 24-hour video surveillance, and an on-site resident manager to provide peace of mind. Extra Space Storage is committed to providing an excellent self storage experience. From our friendly, professional staff to our clean, secure, and well-maintained facility, you can expect nothing but the best customer service from us. Contact us today to reserve a storage unit in Sacramento! Clean place, friendly employees. Reasonably priced. Do not choose this facility! Unless you want damage from mouse droppings on your valuables that is not taken seriously and addressed immediately! Absolutely disgusting! Also false advertisements!!!!!!! I have been with Florin Rd site for quite a few years now. I have always come to this place any time my family or myself needed storage. The staff is great and friendly. Very secure place to store your stuff I haven't ever had any problems with this place. Great staff, clean grounds & storage units. Would recommend to friends. Good prices on the storage units also. I like my location of the unit, the safety feeling i get when unloading my items. and the organization in the management department. Thank you for your kindness and where i am storing my junk. Paul is friendly and very helpful great service not only to me but the everyone who walked in the door. He was informative and polite. The place is very clean. From the minute I stepped into the building I felt important. I was not forced to do anything I didn't want to do such as taking a larger storage or pressured to have my storage there. Paul ensured that I understood the paperwork and what I was signing for. The conversation was light and friendly. I'm happy with the overall attention to details. The staff are very friendly and helpful - the facility is clean and seems reasonably safe and well attended. I have rented for approximately 2 years and have had a minor leaking issue and when I contacted the facility, they fixed the issue quickly. Which saved from causing any damage in my unit. The staff has always been helpful when I have been there and the units are clean and I would recommend renting there to anyone. the hours that they are open is great and easy to use. The staff is so friendly & helpful...Hassel Free is all I can say! Erin was so kind to work with me with all my storage space questions as well as moving to a bigger storage space without any issues. So Thank you for all your kindness and help!! You guys are the greatest! I will definently recommend your facility to anyone and everyone who needs extra storage space!!! Our family has used ExtraSpace Storage at the (Sacramento - Florin RD) location for a few years now without any problems. The facility is clean and secure, and the staff is very friendly and professional. From I-5 North- exit Florin Road East. Follow the right hand curve onto Florin Rd. Take Florin Rd about a mile down. You will pass us on your left hand side. Continue to the next stop light next to Arco. Make a U-Turn and in about half a block, you can pull into our parking lot. We are directly across from the CVS at the corner of Florin Rd and Freeport Blvd. If you are coming from the east, Take Highway 99 to Florin Rd West. Follow Florin Rd heading west like you're driving to I-5. You will pass over Franklin Blvd, passing the 99 Ranch parking lot. Continue down Florin Rd. We will be on your right hand side just before Freeport Blvd. We are right across from the CVS. From the West you'll want to head down Florin Rd like you're headed toward Hwy 99. Just after Freeport Blvd, you will pass us on your left hand side. Continue to the next traffic light next to the Arco and make a U- Turn. About half a block back you will be able to pull into our parking lot.